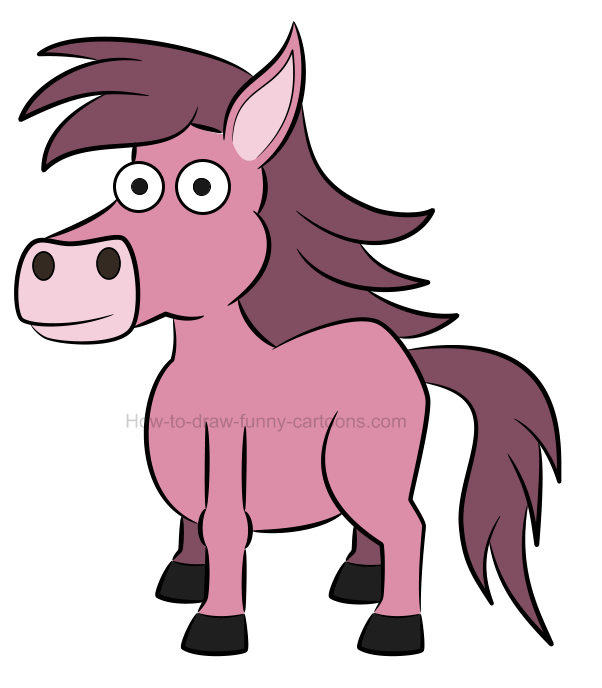 Learn how to create an illustration of a pony and then see how to create various crest for this adorable cartoon animal. Ponies are quite similar to horse when it comes to drawing these animals. 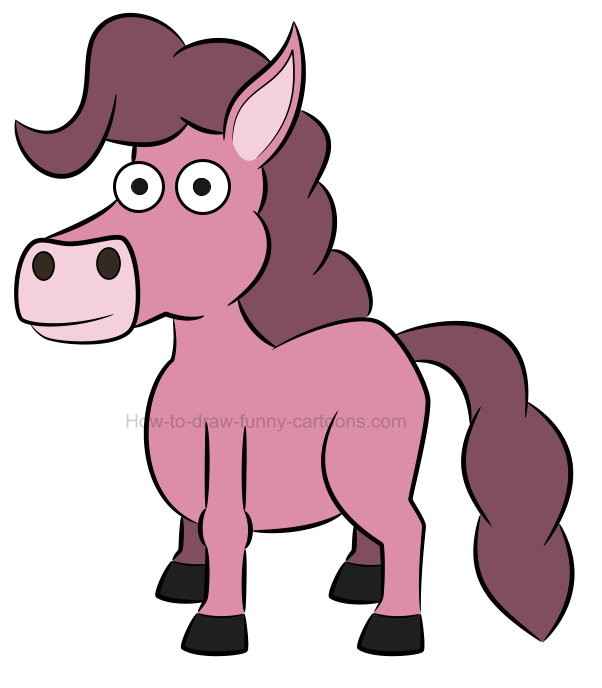 Of course, a pony will be shorter and the body can be a little bit smaller, but overall these characters are presenting similar challenges that we will cover using the illustration below. Eyes of the character are made from circles while pupils are done using large dots. The ear on the back is slightly visible just above the crest. This crest is made from various curved lines and filled with a dark pink color. Both ears are large and pointed near the end. A brighter patch is visible inside the left ear. The jaw is made from a long curved line. The back of the animal is strong and created from multiple curved lines. A large tail is drawn on the back of the pony. The back leg is larger and stronger than the front one. 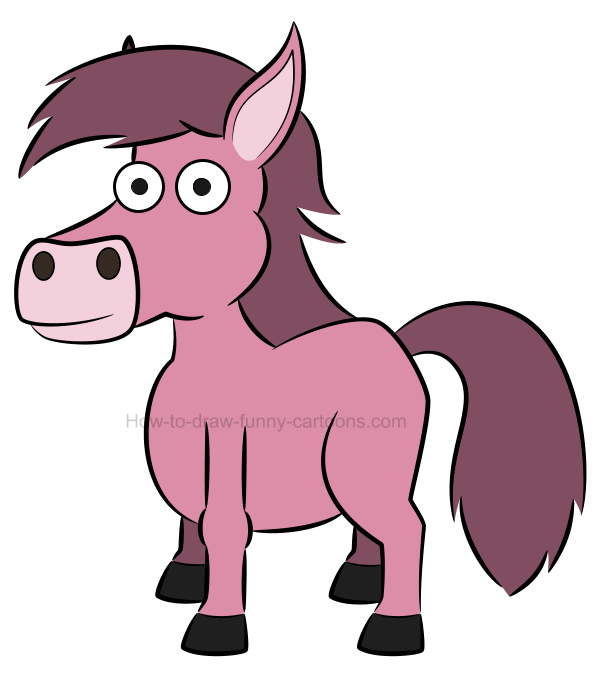 Hooves are made from solid rectangles. The front of the pony is round and also strong. The neck is large and created from small lines. The mouth is surrounded by a large rectangle. Oval shapes are used to represent the nose of the cartoon pony. Excellent! 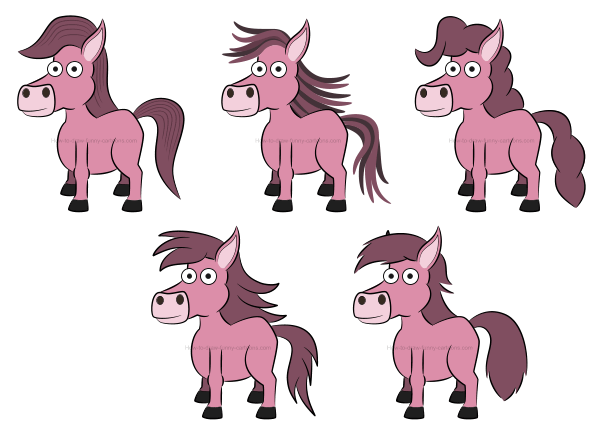 Now we can start working on this lesson on how to create a simple illustration of a pony. Once this tutorial is completed, I will show you a few additional versions of the same character using different crest. You can start by creating a guideline that will be used to sketch accurate proportions. 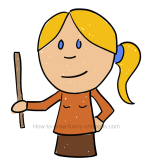 First, draw the head using a circle. The jaw is done using a square while the ear is represented by a small, but long oval shape. Next, draw another large oval shape to form the body. All legs are made from rectangles. The neck is done using a small square and a large circle is added on the top of the back leg. 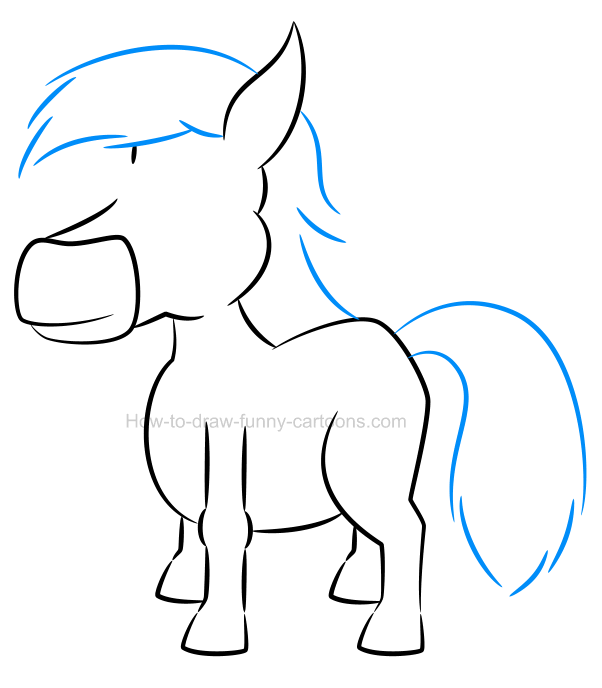 Let's create this illustration of a pony using our template as well as a mix of straight and curved lines. 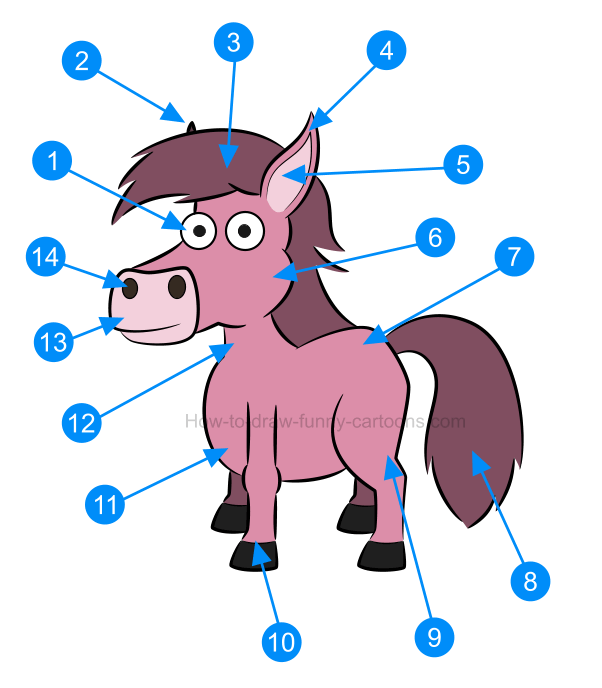 Pay attention to areas like the ear, the jaw, the back of the character, the front and back legs and the hooves. Once you are done, you can erase all solid shapes created in the previous step. step 4 - more circles and oval shapes are needed! Inside the head of the pony, draw two large circles to form the eyes. Pupils are made from small dots. 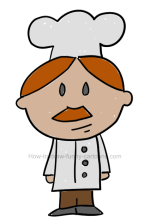 You can also draw two small oval shapes just above the mouth to represent the nose of the cartoon animal. That's it for this step! Good work! Our illustration of a pony is almost completed. Above the crest, draw a tiny triangle to form the ear visible on the far side. Inside the left ear, you can draw a patch using long curved lines. 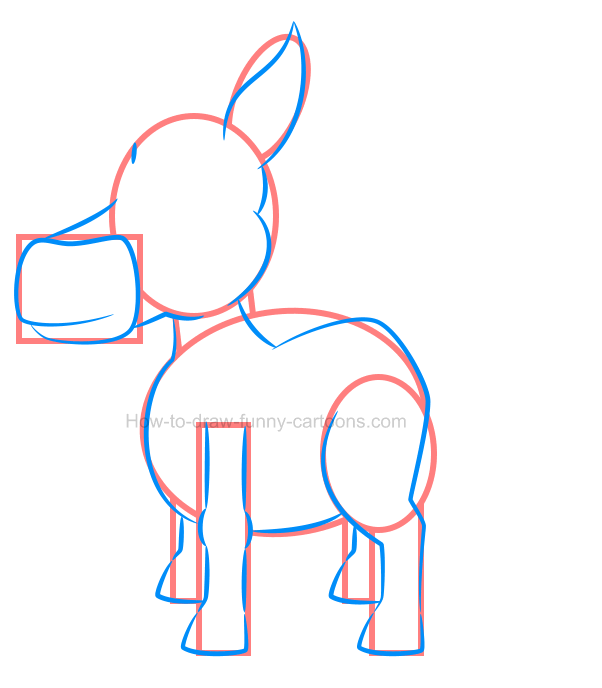 Finally, you can separate the hooves from the legs using small curved lines. step 6 - it's time to add some colors! 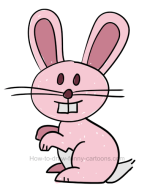 As I said previously, this cute cartoon character is filled with a bright pink color. The crest and the tail are filled with a darker version of the same color. Patches around the mouth and inside the ears are brighter. The hooves are black, just like the pupils and the nose. ... but we are not done yet! 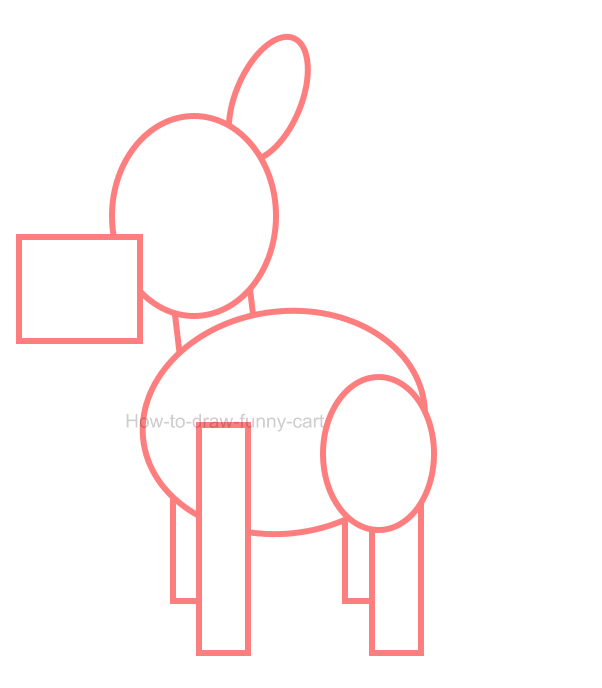 Indeed, you can see below all six steps required to draw this animal quickly and properly. There is one part of the character that could be different: the crest! Let's see in this second part of the tutorial how we could improve the tail and the crest using different shapes and lines. In this illustration of a pony, the crest and tail are made from long curved lines that are not filled with hair flying all around. Instead, texture was added inside both shapes using lines that are filled with a light pink color. 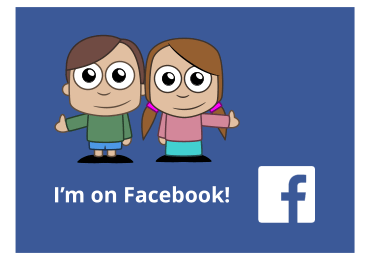 It's a simple approach that is interesting and easy to implement. 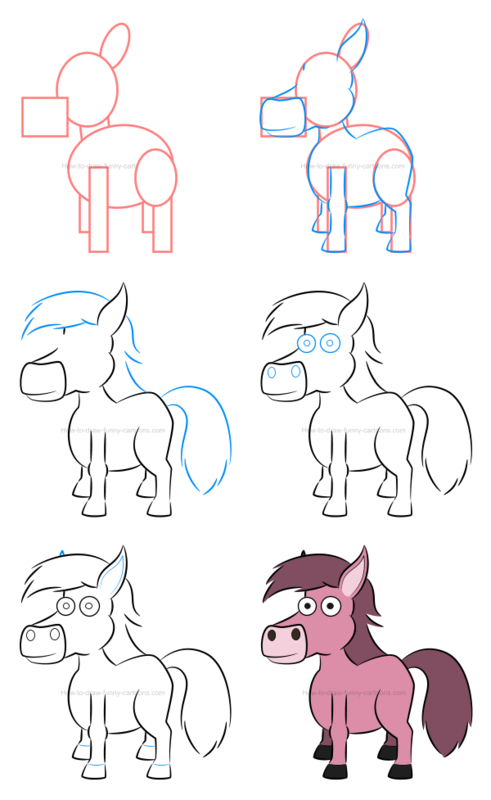 For this second option, thick lines are used to sketch the crest and the tail of the cartoon pony. 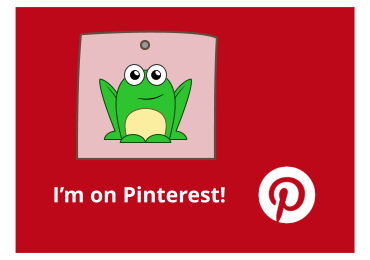 Unlike previous versions (and versions to come), this picture is fun because two colors are used instead of just one. These elements are more dynamic and visually more fascinating. This third illustration of a pony is featuring a crest and a tail mostly made from medium curved lines. The character feels prouder and wiser. That's right! 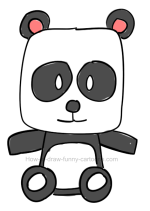 Modifying these body parts can give a whole new attitude to the character, which is good news if you are looking to draw this type of animal. The final alternative is quite similar to the original one except all shapes used to create the crest and the tail are mostly made from thick triangles. We feel like the character is located in a windy area! Cool! 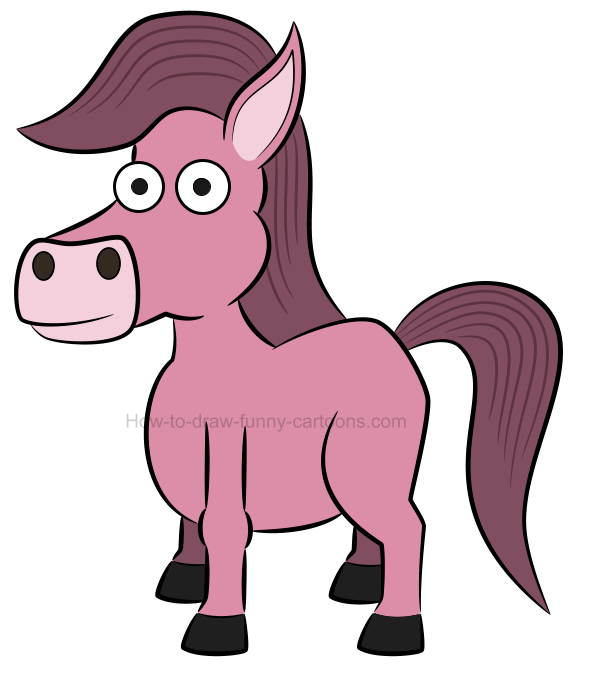 I hope you had fun working with this illustration of a pony. It's now your turn to use this character and create an original crest and a unique tail. 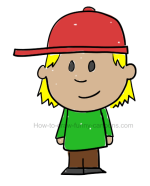 Possibilities are virtually endless if you mix a few of these examples or just try a few new things that can add more personality to the cartoon character. 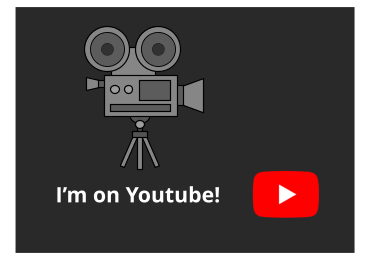 Have fun with this tutorial and don't forget to practice often.